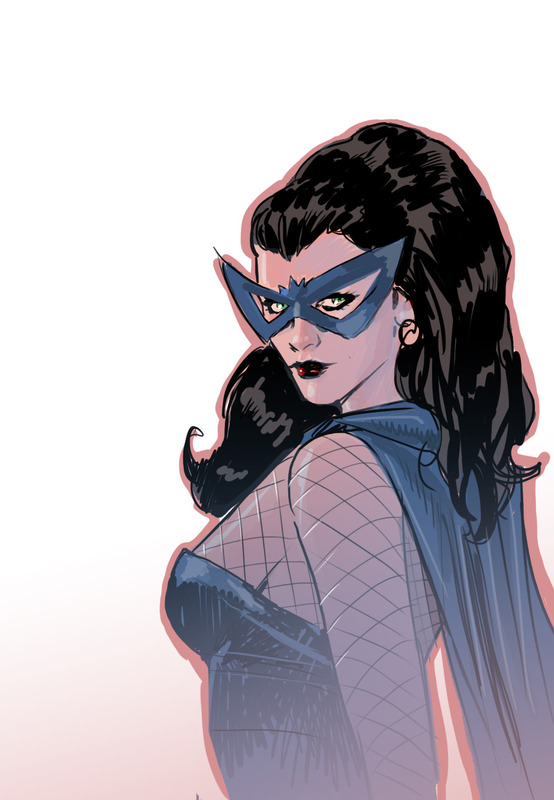 I really love how Dottie Underwood is shaping as some sort of Early Days Natasha! There was a line in the latest episode about how she’s a Russian spy who failed to complete a mission and now the soviets don’t want her back and she has to figure out what to do in the US. It’s the exact position Nat was in back in the 60s and I’m so glad we’re getting to see some of that explored in the cinematic universe, even if it’s through another character. And Bridget Regan is absolutely phenomenal! The colors are different, though clearly Black Widow inspired. 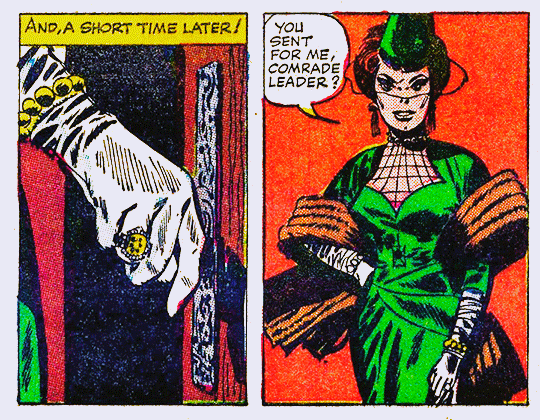 But the dark hair and netted hat, the opera gloves and luxe finishing? That’s a clear visual reference to the Tales of Suspense #52 catalogue. 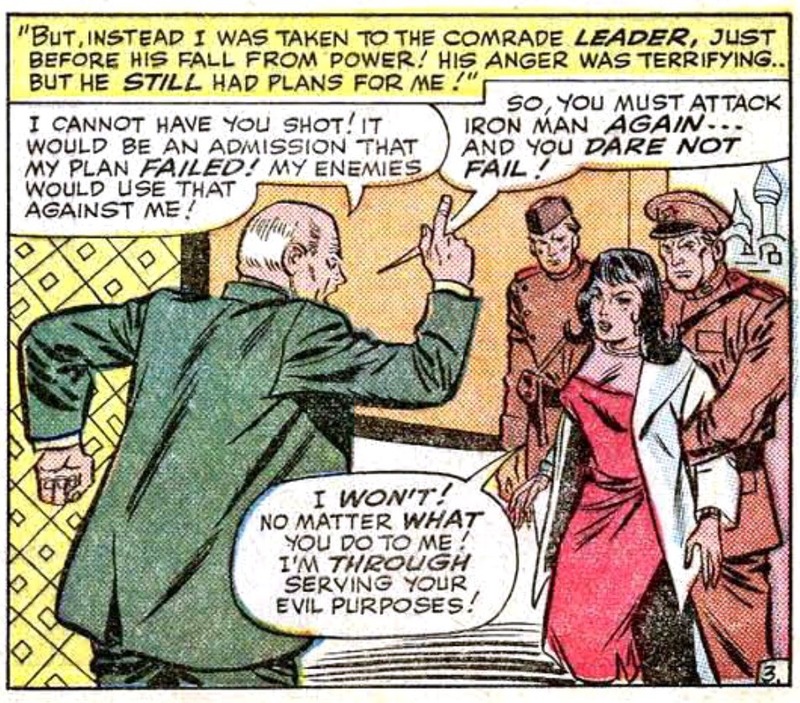 Natasha: You sent for me, Comrade Leader? This is the nifty thing about adaptations and multiple universes and all the branching overlaps of Marvel continuities. Seeing things remixed and repeated, and that rewards viewers investment in the details. But the sameness also showcases differences. Dottie isn’t a version of Natasha, and she won’t react to Natasha’s predicament (or her outfits) the way that Natasha did. It’s building a legacy, but it sharpens each women’s uniqueness. 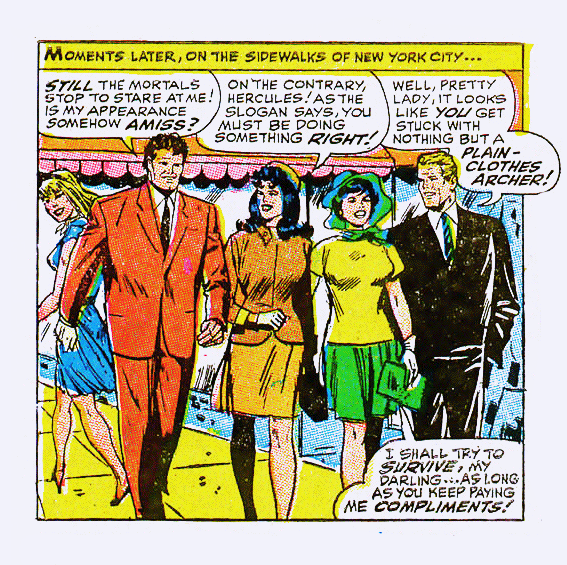 Panel from Natasha’s very first appearence in Tales of Suspense #52 . Posted on February 27, 2016 Tags agent carter, black widow, bridget reagan, dottie underwood, martotheavenger, mcu, natasha classic, questionsLeave a comment on I really love how Dottie Underwood is shaping as some sort of Early Days Natasha! There was a line in the latest episode about how she’s a Russian spy who failed to complete a mission and now the soviets don’t want her back and she has to figure out what to do in the US. It’s the exact position Nat was in back in the 60s and I’m so glad we’re getting to see some of that explored in the cinematic universe, even if it’s through another character. And Bridget Regan is absolutely phenomenal! Natasha: There’s no need to shout, my amorous archer! 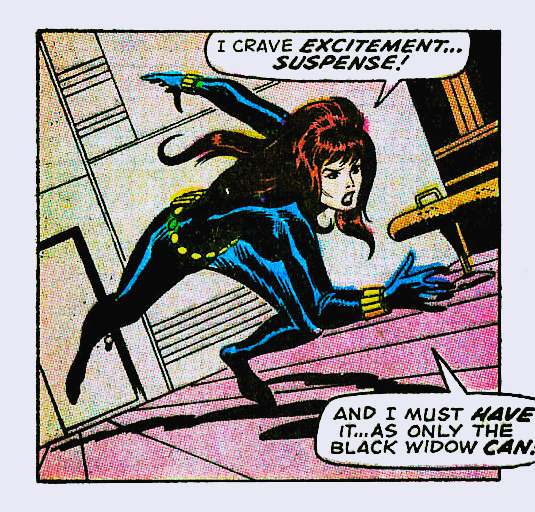 You’ve seen the Black Widow walk on ceilings before! Clint: Mebbe so… but I didn’t think I was gonna see it again! I thought you gave up all that jazz… for good! From Avengers #57 , by Roy Thomas and John Buscema. 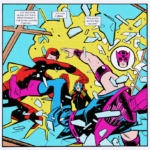 Waid/Samnee’s Daredevil #11 vs. Gerber/Kweskin’s Daredevil & the Black Widow #99. Hercules: Still the mortals stop to stare at me! Is my appearance somehow amiss? Wanda: On the contrary, Hercules! As the slogan says, you must be doing something right! 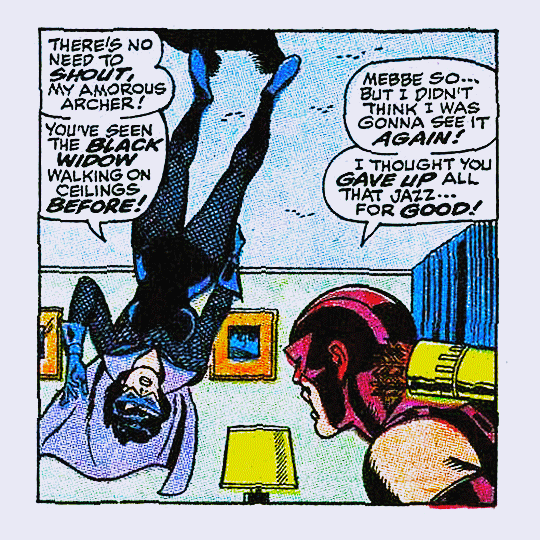 Clint: Well, pretty lady, it looks like you get stuck with nothing but a plain-clothes archer! 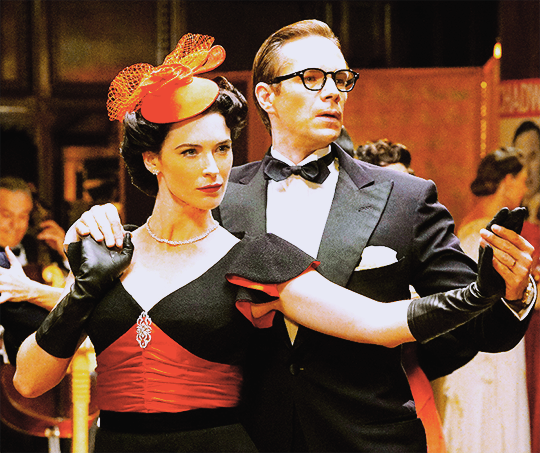 Natasha: I shall try to survive, my darling… as long as you keep paying me compliments! From Avengers #46, by Roy Thomas and John Buscema. Clint: Up your horns, fella! I’m not leavin’ without ‘Tasha! Matt: Keep wishing, Avenger! The Widow’s not up for grabs today! Natasha: That’s enough— both of you!! I go where I please— with whom I please! Clint: That’s tellin’ him, Spider Lady! Matt: Hawkeye, do me a favor: shut up! Natasha: I wish both of you noble, selfless defenders of the good would start acting the part. Meaning, can we go inside and discuss this like civilized human beings? 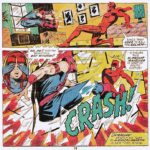 From Daredevil and the Black Widow #99, by Steve Gerber and Sam Kweskin. Ramrod: An’ ya can forget them Widow’s Stings lady! I don’t even feel ‘em! Natasha: — just maybe— you’ll feel this! See, you have to catch me before you can dismember me. Only I won’t let you catch me! Frustrating, isn’t it— for a big strong man like you? Ramrod: Back on the oil rig, lady, we had a word for yer kinda dame! Natasha: Tch tch, nasty nasty! You wouldn’t call me evil names, would you? I mean— I blush at such words in mixed company. Matt: She’s absolutely right, Rammy! Now, you apologize! Better yet— just shut up and go away! Natasha: Aw! Did wamwod twip on biwwy cwub cable? People who think Natasha is only a troll in MCU are wrong. 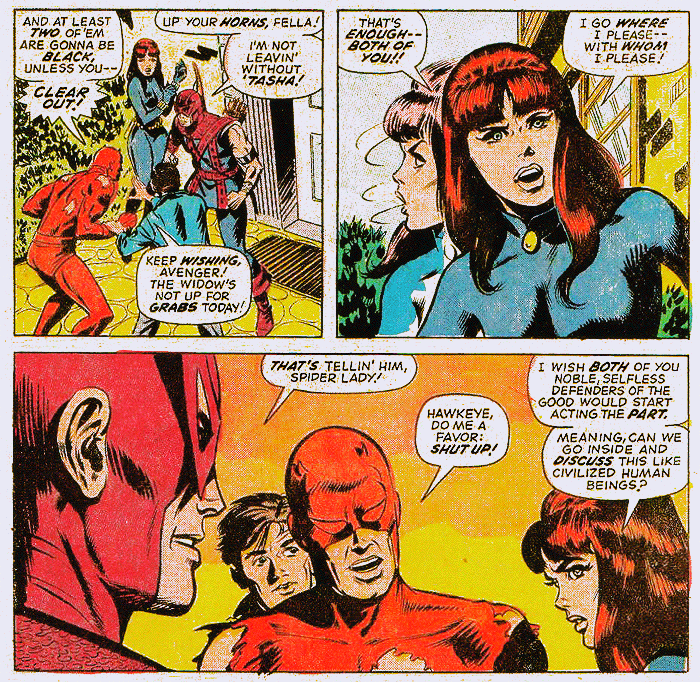 From Daredevil and the Black Widow #106, by Steve Gerber and Don Heck.